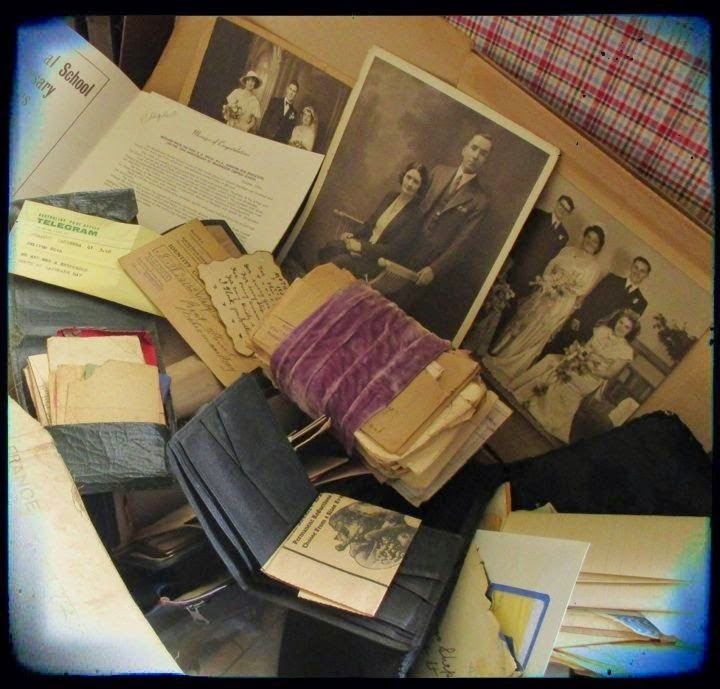 It is time to rummage in Aunty Glad's Suitcase again! Today's discovery is a post card from Malcolm Michael Shepherd to his brother Angus. The card was posted on Thursday 10th June 1916, Telelekebir and would have been posted from Port Suez, when Malcolm was travelling through to England on the Hororata with his Battalion (7th Reinforcement of the 30th Battalion) to England. The 10th of June 1916 was the day his Battalion, would have received the news that they were proceeding on to Alexandria. See below a short extract from my recent post on Malcolm's journey from Australia to England. "June 9 – Anchored in Port Suez. At 2 p.m. weighed anchor and entered Suez Canal. I am told that all troops that came over before us were allowed ashore to strength their legs, but for some reason or other we were not allowed to do so. It was very interesting going through the Canal. It is well guarded day and night. Here and there in isolated spots one can see a small patch of grass struggling for life, or else a few reeds growing on the edge of the canal. With that exception all one could see was one long strength of sand, white and glistening with camps of troops dotted here and there over the desert. No one was more pleased that I when we were told that we had to proceed to Alexandria. The sight of that vast stretch of sand and the temperature was quite sufficient for me. All the boys who had the bad luck to be stationed there have the sympathy of every one on board our boat. The Canal is reckoned to be 34 miles long and takes 16 hours to do a trip through, as boats are not allowed to travel any faster than 5 miles per hour on account of the was doing damage to the banks. Leaving the Canal we came along to Port Said, arriving there about 7.30 am. Port Said presents a very busy scene by what one can see from the boat. It is a hurry and scurry, small pleasure boats rowing about everywhere. June 11 – Leaving Port Said we went on to Alexandria. As soon as we left Port we were ordered to don life belts and were never without them till we arrived at Plymouth. They were worn all day, and even slept in them. It was a very queer sensation to wake up the first morning and find a life belt hanging to one’s neck by a piece of tape. It made one feel as if one had been having a night out, and did not remember what had taken place before retiring." Telelekebir, is about 110 kms north east of Cairo. Malcolm reports that one of his friends, Tom Garratt, has been taken to hospital in Cairo, as he had been sick for over a week. 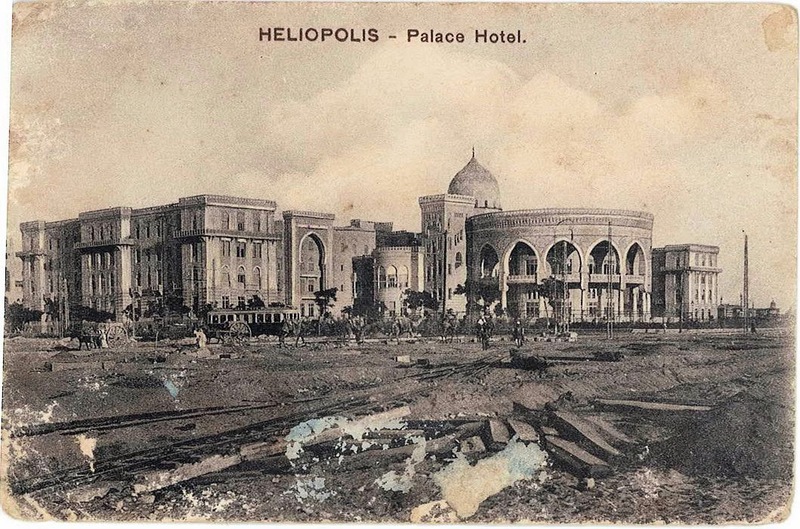 The picture on the front of the card is of the Heliopolis Palace, is now one of the three royal palaces in Cairo. It was built in 1910 as a grand Hotel. This grand hotel would have certainly made an impression on the young soldier from the small southern highland village of Braidwood, NSW. 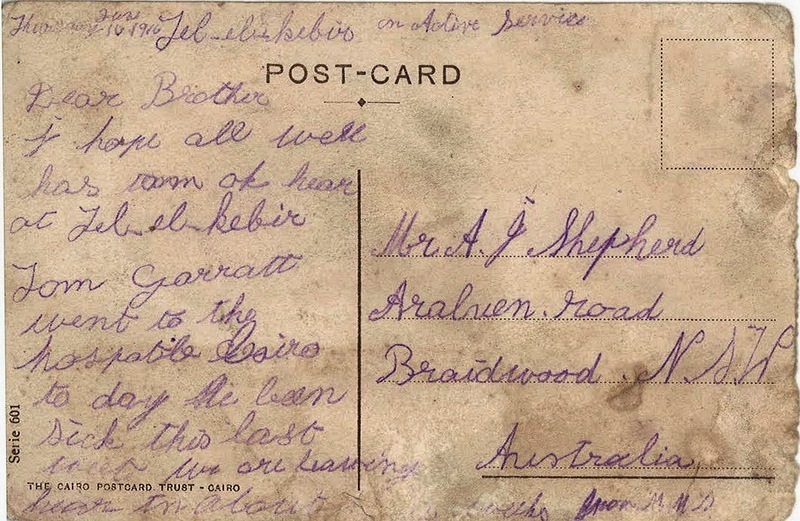 Front of Post Card sent by Malcolm Michael Shepherd from Suez. Once again, I have to count my blessings, and thank Aunty Glad for having the forethought to save all these wonderful family memories, that give such meaning to our family stories.